When Man of Tai Chi opens, two men battle in front of a backdrop reminiscent of early '90s SNES console fighting games. It's captured with spatially incoherent, sweeping camerawork that emulates the sort of gauche visualizations of later renditions of these wildly popular videogames, culminating in the omniscient utterance of "Finish him!" after one man beats another into submission, acknowledging, and presumably critiquing, populist escapism like Mortal Kombat. Why something as out-dated as Mortal Kombat acts as a frame of reference for Keanu Reeves's directorial debut may have something to do with its context, being an early indicator of a passive digital age desensitized to violence (the bloodletting was controversial in its time) or it could just be a nod to fighting style evolution and the Westernized exploitation and bastardization of Asian mysticism. Though, as the plot progresses and it becomes clear that Reeves is interested only in filming highly stylized Tai Chi fights, it seems more likely that this flimsy, bland criticism of sensationalized spectatorship exists mostly as an afterthought to justify the existence of this film. 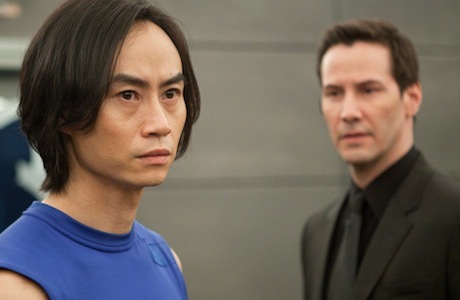 Said afterthought is presented very much like the plot of a videogame, with mysterious millionaire Donaka Mark (Keanu Reeves) bringing Chen Lin-Hu (Tiger Hu Chen), a delivery driver balancing meditation with Tai Chi fight training in his spare time, into his wildly lucrative underground fight ring. Though undefined initially, we know this elaborate bit of snuff entertainment is broadcast over the Internet to those willing to pay the high price. As Lin-Hu finds himself stumbling ever-closer to the dark side, motivated mainly to earn cash to save the temple where he trains with his Master (Yu Hai), he's approached by Sun Jingshi (Karen Mok), a Hong Kong police captain trying to locate the ring and discover what's happened to an endless array of missing fighters. The plot, which is as generic as the moral babble about meditation being key to balancing inner-darkness, is as predictable and perfunctory as it is irrelevant. The exposition and characterizations established throughout Man of Tai Chi merely exist to contextualize the increasingly protracted and violent fights. Initially, Lin-Hu winds up on neon platforms fighting two people at once in front of a strobe light, but eventually graduates to grittier, bloodier battles that find him moving away from his Tai Chi roots. It's obvious that Reeves put a great deal of thought into how he would film the many choreographed battles. The camera is always on the move, vacillating between sweeping aerial photography and static shots of the impressive stunt work. However, it's in no way consistent or visually coherent, moving around without any sense of progressive logic or style, which bleeds into the exceedingly choppy and borderline laughable moments occurring between the action scenes. As such, the basic impetus for the film — showing the talents of Tiger Chen — never really works, being lost in an ugly and desultory series of compositions. Even a classic stationary approach would have been more dignified than Reeves's attempts to invigorate the material by capturing it through a series of awkwardly juxtaposed angles and perspectives. It's possible that the sheer buzz and celebrity involved may help Chen land bigger roles in other films, but it's unlikely that anyone will be taking Reeves seriously as a director.